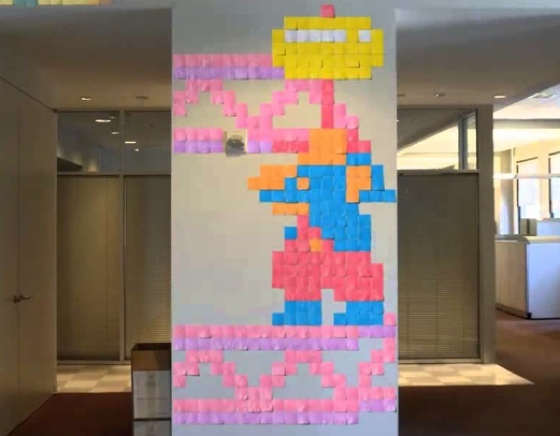 I can’t even begin to imagine how much time it took Michael Birken to put this post it note arcade animation together. Well I can, kind of. It took him 96 days, spread out over 11 months. Of course that’s just the data. The reality of having a project constantly on the go for nearly a year is pretty mind boggling. The way it turned out was amazing though. This stop motion tribute to my 2 favorite old school arcade games is based on actual recorded game footage. The recordings were printed out, one frame at a time, and transferred by hand to various walls around my office floor using thousands of Post-It Notes. The process consumed weekends and holidays for the past 11 months. Changing background scenery was masked out and replaced with 1 consistent frame throughout the animation, producing an eerie stillness amid the moving images on the walls.